The latest scores and news from around Eastern Massachusetts. The second half is about to start with English leading South Boston 16-0. English will receive the ball to start the half. South Boston gets the ball on an English fumble. They have it on the English 38. Here is the English TD. South Boston gets on the board with a 2-yard touchdown pass in the fourth. English leads 24-8 with time ticking down. Touchdown CM. Senior Jack McGowan runs it in from 22 yards out. 2-point pass falls incomplete. 7-0 CM, 8:20 to go in the first. Backup Eagles QB Matt Sullivan with a 70 yard touchdown run. 36-0 BC High, 5:40 left. Final: BC High over Leominster, 36-0. Brockton fumbles on the first play of the ensuing drive. CM recovers at the Brockton 22. Final score 27 - 8 Franklin Panthers over Taunton Tigers. Congrats to Coach Bain and his team for Franklin's first win of the season! FINAL: No. 10 Catholic Memorial 34, No. 9 Brockton 0. 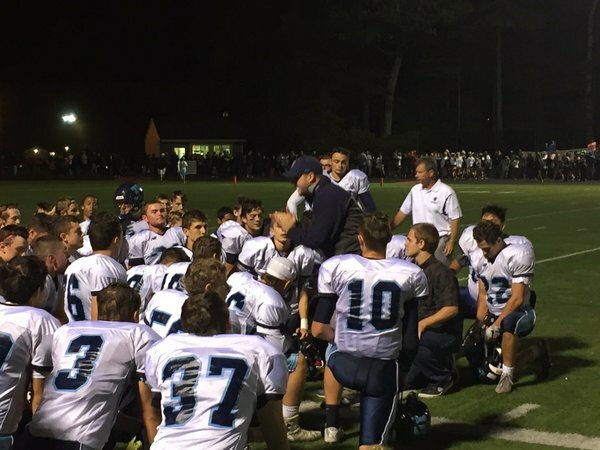 Hawks rebound in a big way 49-0 over Barnstable. Aronson with a TD run, PAT is no good, Panthers lead 30-6, 6:18 left in the game. Alex Sliney with a big 37 yard FG puts Needham up 31-20 with 4 min to play! Update: the rain has stopped. Another update: the game has been over for 45 minutes. Prep with the ball to start the third, driving into Everett territory. Backup Prep QB Chris Burke with a one-yard keeper to make it 35-14 Everett with 3:02 left. End of the third: Mississippi State 41, UMass 21.